We have operations around the world, cemented by the enduring quality of our products and the reputation we have worked so hard to earn and maintain. Lee Applbaum is responsible for developing the global marketing vision and premium positioning for the GREY GOOSE® vodka and Patrón Spirits portfolios, including the world’s number one ultra-premium tequila. He will direct global integrated marketing across creative, media, new product development and innovation, and experiential for the Patrón Spirits portfolio and GREY GOOSE. With Patrón Spirits since 2013 and expanding his role to head up global marketing for GREY GOOSE in August 2018, Mr. Applbaum has been recognized by Adweek as a “Brand Genius,” the magazine’s highest marketing honor, and the “Most Innovative CMO” by Business Insider. Denis Brown is responsible for commercial operations in Greater China, Australia, New Zealand and North Asia. Mr. Brown has spent most of his 30-year career in the spirits business and has a global perspective having lived and worked in Eastern Europe, Southeast Asia, the United Kingdom, and his native Australia. He most recently led Bacardi’s operations in Australia as managing director. Before joining Bacardi-Lion in 2014, Mr. Brown held various sales, customer marketing, innovation and consultancy positions with Diageo, GWA International, and PwC. Mr. Brown is based in Sydney, Australia. John Burke is responsible for providing overall leadership and strategic direction to Bacardi’s consumer and customer marketing organizations. With Bacardi since 1993, Mr. Burke has achieved notable success during his more than 25-year career at Bacardi. He has had diverse experience working in country operations, regional and global sales and marketing, including as the lead for core brands in the Bacardi portfolio including BACARDÍ®, BOMBAY SAPPHIRE®, MARTNI®, and DEWAR’S®, and, most recently, as president of Incubation brands charged with driving brand equity in the fastest-growing premium brands in the Bacardi portfolio including ST-GERMAIN®, BANKS®, ANGEL’S ENVY®, and LEBLON®. Mr. Burke is based between London and the Bacardi global headquarters in Hamilton, Bermuda. Pete Carr is responsible for commercial operations in North America. Mr. Carr has worked in the spirits, wine, beer and non-alcohol beverage industry for nearly 28 years. Prior to joining Bacardi in September 2014, Mr. Carr was most recently Executive Vice President for privately held Glazer’s Distributors, one of the country’s largest distributors of wine, spirits and malt beverages. Prior to joining Glazer’s, Mr. Carr held various senior management roles with Diageo including President of U.S. Spirits, President of Sales for Diageo-Guinness USA, and President of Control States. Mr. Carr is based in Coral Gables, Florida. Francis Debeuckelaere is responsible for commercial operations in Europe. Prior to this regional appointment in 2017, Mr. Debeuckelaere was VP & Managing Director for Northern Europe for Bacardi. In a career with Bacardi spanning nearly 25 years, Mr. Debeuckelaere has led several European markets to great success. Under his leadership, the size of Bacardi in Belgium more than doubled, going from the #3 spirits company to #1. Similarly, Bacardi in the Netherlands went from #3 in the market to currently #1. 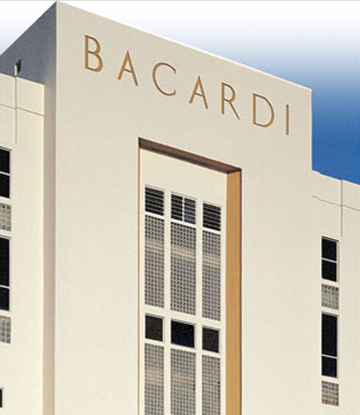 And, after he helped establish the company in Switzerland in 2004, Bacardi grew into the country’s #3 spirits company. Before joining Bacardi, Mr. Debeuckelaere held marketing positions with Nestlé and brewer Alken-Maes. Mr. Debeuckelaere is based in Amsterdam, Netherlands. Ignacio del Valle is responsible for commercial operations in Latin America and the Caribbean. A 21-year veteran of Bacardi, del Valle has worked his entire Bacardi career in Latin America & Caribbean across different markets and functions. For more than 15 years he has served on the regional leadership team in commercial and production roles including Country Manager for Central America and Managing Director for South America. He most recently led Caricamar which includes the Caribbean, Central America, and the Andean countries of Colombia, Ecuador, and Venezuela. Mr. del Valle is based in Panama City, Panama. Maurice Doyle is responsible for driving brand equity and accelerating performance in some of the smaller, high potential premium brands in the Bacardi portfolio including ANGEL’S ENVY®, ST-GERMAIN®, BANKS®, SANTA TERESA®, FACUNDO™ Rum Collection, and LEBLON®, as well as driving sales performance and travel retail globally. Mr. Doyle spent 17 years with Bacardi in travel retail, commercial and marketing roles before he left the company in 2009. Prior to re-joining Bacardi in November 2017, Mr. Doyle served as CMO at William Grant & Sons, and most recently as Chief Operating Officer for Suntory’s non-alcoholic division for Africa, Middle East & Caribbean. Mr. Doyle is based in London, England. As senior vice president and global chief communications officer, K.C. Kavanagh is responsible for internal and external corporate communications, as well as brand public relations campaigns for the Bacardi portfolio of iconic brands. In addition, Ms. Kavanagh oversees the company’s corporate and brand archives ensuring the preservation of legacies, management of heritage assets, and protection of brand trademarks. Prior to joining Bacardi in October 2016, Ms. Kavanagh was most recently with Starwood Hotels & Resorts Worldwide, Inc. where she was a member of the company’s senior leadership team and led global communications for the hotel giant and its 11 brands. Prior to Starwood, she oversaw public relations for Hyatt Hotels Corporation. Ms. Kavanagh is based at the global headquarters in Hamilton, Bermuda. Jean-Marc Lambert leads the global operations group with responsibility for global supply chain, distribution, procurement, and research and development (R&D) activities. for all its main production facilities globally. Mr. Lambert is based in Geneva, Switzerland. Mahesh Madhavan was appointed Chief Executive Officer of Bacardi Limited and was elected a Director by the Board in September 2017. A more than 20-year veteran of Bacardi, Mr. Madhavan most recently led Europe for Bacardi as its Regional President where he was responsible for commercial operations. During his tenure with Bacardi, he has held leading roles within various emerging markets including Regional President of Asia, Middle East & Africa (AMEA), Managing Director of India, Managing Director for Thailand and the Philippines, and Managing Director of South Asia and Southeast Asia. Mr. Madhavan is based at the global headquarters in Hamilton, Bermuda. Scott Northcutt is responsible for all aspects of employee career development, employee benefits, succession planning, as well as management and organization development. He joined Bacardi in August 2009 with more than 20 years of experience in the international human resources field, having held key leadership positions in several global companies. Mr. Northcutt is based in the global headquarters in Hamilton, Bermuda. Oksana Pevtsova is responsible for commercial operations in Eastern Europe. Oksana joined Bacardi in 2007 as Finance Director for Russia and was appointed to the role of Country Manager for Ukraine in October 2011. During her tenure, the Ukraine business grew significantly despite the socio-political difficulties the market was experiencing. In April 2015, she was appointed Managing Director for Russia and in March 2017 she was promoted to VP & Managing Director for Eastern Europe. Prior to her roles at Bacardi, Ms. Pevtsova held various finance roles at Moneks, Nestle Waters, and Unilever. Ms. Pevtsova is based in Moscow, Russia. Eduardo Sánchez is responsible for the global legal function. Prior to joining Bacardi in 2003, Mr. Sánchez served as Vice President and Deputy General Counsel of North and Latin America with the Coca-Cola Company. Before that, he was Vice President and General Counsel with Bestfoods, a leading international consumer food company acquired by Unilever. He spent seven years in Brussels as Division Vice President and General Counsel for Europe, Africa and the Middle East for Bestfoods. Mr. Sánchez also worked as international corporate counsel with Firestone Tire & Rubber and United Brands. He began his legal career in 1977 with Fried, Frank, Harris, Shriver & Jacobson in New York City. Mr. Sánchez is based in the global headquarters in Hamilton, Bermuda. Leila Stansfield works closely with leaders across the Bacardi business to develop a compelling, ambitious and achievable long-term strategy. She joined Bacardi in 2010 heading up global strategy and planning before moving into a Finance Director role. She was most recently Marketing Director for the Global Travel Retail division leading Customer Marketing and Revenue Growth Management teams to convert consumer brand strategy into effective in-store execution. Ms. Stansfield is based at the global headquarters in Hamilton, Bermuda. Vijay S. Subramaniam is responsible for commercial operations in the Asia, Middle East & Africa (AMEA) region for the company’s portfolio of premium spirits. With Bacardi since 2013, Subramaniam served as Managing Director of India, and most recently expanded his role to lead the Middle East. Before joining Bacardi, he spent 12 years in various general management roles within AMEA working in diverse, multi-cultural environments. Mr. Subramaniam will be based in Dubai, United Arab Emirates (UAE), pending immigration approvals. Jacques Tortoroli is responsible for the global Finance, Treasury, Operations, Information Technology and Real Estate functions, including brand homes. He has more than 35 years of leadership roles across strategic and financial planning, sourcing, risk management, knowledge management, internal audit and investor relations. Prior to joining Bacardi in 2014, Mr. Tortoroli held the dual role of Executive Vice President of Financial Services for Viacom and EVP & Chief Financial Officer for Viacom Media Networks (formerly MTV Networks). Mr. Tortoroli is based in the global headquarters in Hamilton, Bermuda.